Σχεδιασμένο για ταξίδια τόσο επαγγελματικά όσο και διασκέδασης, το rock n reef είναι ιδανικά τοποθετημένο στη Ουλουβουάτου, μια από τις διασημότερες περιοχές της πόλης. Το ξενοδοχείο βρίσκεται 20 km από το κέντρο της πόλης και σας προσφέρει εύκολη πρόσβαση σε σημαντικά μέρη της. Από τη βολική της τοποθεσία, η ιδιοκτησία προσφέρει εύκολη πρόσβαση σε κορυφαίους προορισμούς της πόλης. Όλα γίνονται με γνώμονα την άνεση των επισκεπτών. Για τον σκοπό αυτό, η ιδιοκτησία προσφέρει ό,τι καλύτερο όσον αφορά τις υπηρεσίες και τις παροχές της. Κορυφαία χαρακτηριστικά του ξενοδοχείου συμπεριλαμβάνουν τα 24ωρη φύλαξη, υπηρεσία ταξί, ημερήσιος καθαρισμός, δωρεάν WiFi σε όλα τα δωμάτια, ασύρματη σύνδεση Wi-Fi σε δημόσιους χώρους. Η ατμόσφαιρα του rock n reef αντανακλάται σε κάθε δωμάτιο. Στην ιδιοκτησία θα βρείτε κρεμάστρα ρούχων, πετσέτες, ντουλάπα, σύνδεση internet (ασύρματη), δωμάτια για μη καπνίζοντες, καθώς και πολλά άλλα. Η πλήρης λίστα των ψυχαγωγικών υπηρεσιών είναι διαθέσιμη στο ξενοδοχείο, συμπεριλαμβανομένων των σνόρκελινγκ, κανό, μαθήματα σερφ, ιδιωτική παραλία, εξωτερική πισίνα. Το rock n reef είναι ένας ιδανικός τόπος για να μείνετε αν ψάχνετε για γοητεία, άνεση και ευκολία στη Μπαλί. A beautiful hotel with fantastic staff. It isn't 5 star luxury but if you don't mind the 101 steps you will have a great holiday. Access to Rock snd Reef is not for the feinted hearted, especially arriving on a rainy night when the power was out.! We didn’t get the room we booked due to renovations. The larger room we were given was okay but not the uninterrupted ocean view we expected and looked forward to. Much needed repairs were happening while we were there which would have been nice to know about. The location down the cliff on a beautiful secluded beach is amazing! The small village with excellent cafes is only about 15 minutes walk. Taxis in the area expensive. Breakfast was great and the evening meals were quite good also. Christophe was very welcoming and helpful as were the other staff. Rooms cleaned every day but always had to ask for water for the room as it was never replaced. I do think it is expensive for the standard of room but the location is what would take us back to Rock and Reef. Would we return? Yes but I would be more selective with my room choice and ensure I arrived in day light! Fantastic views! It’s a bit of a trek down several stairs to get there, but the view from this hidden paradise is well worth it! Really enjoyed my stay...the staff was great and overall very accommodating. They offer great options for breakfast, lunch and dinner, you can rent kayaks for free to enjoy at the beach just in front of the villas and they have scooters to rent for a minimal fee. Would definitely recommend to anyone visiting the area! The hotel was so beautiful, the view was amazing. The breakfast was good. BBQ seafood dinner was delicious, however you need to book it in advanced in order for the staff to prepare it. The staffs were friendly and always smiling. Christoph was very helpful, gave us a lot of tips. The only thing that i feel can be improved is to have more lights at night at the round size dining table so that we can see what we eat in case the 6 seater one is occupied. Overally it was a great time! A hidden gem, perfect for a romantic getaway. Simple accom, with traditional local food offerings. All rooms oceanfront, idealic location at Impossibles surf beak. 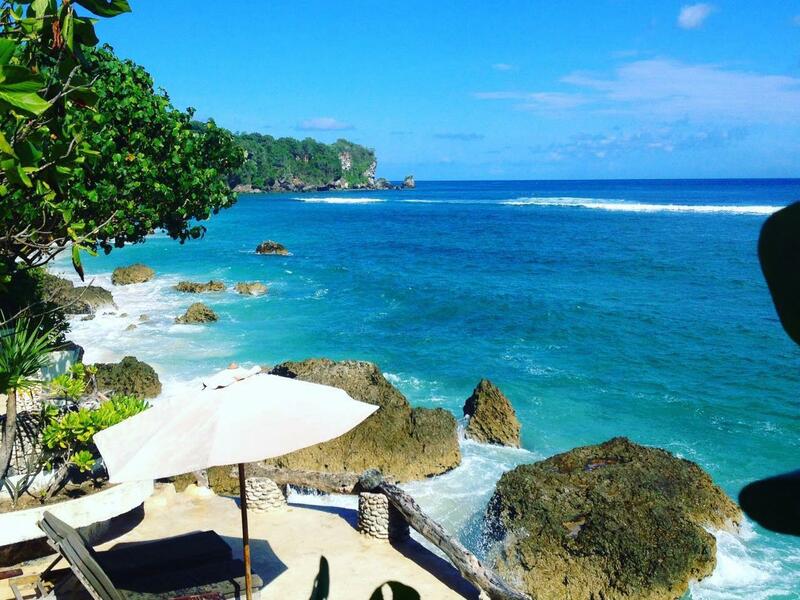 If you are looking to escape the hustle of Bali this place is highly recommended. Manager Chris is helpful and provides expert knowledge without being intrusive. We have had many visits to Bali over the years and and staying here has definitely been a highlight. Lock your doors to ensure you have no troubles from the monkies that decend down to the property once a day. Otherwise, this place is perfect in every way. What more can you ask for than a quaint, reef-chic stay right above the oceans reef? They have everything self contained location so you don’t need leave: drinking water, diverse menu selection, lovely welcoming team, different seating arrangements to keep you excited to try out the next view, waves crashing below, equipment for snorkeling, scootering, boards, kayaking ( some complimentary and some at small price). The rooms are some of the cleanest we’ve had. The Superior Balcony room we stayed hd a unique rock wall in the shower to blend with the landscape and a no-door bathroom arrangement that is not shown in pictures. It was a marvel of room design with usage of space and enjoyed the uniqueness, but likely not preferable for someone who is shy. The stairs are tough but not as bad as some Of the neighboring properties, but why leave? We have traveled around the entire island quite a bit and ended up booking another stay because Rock n Reef is the best in Bali. Bravo! Rock n Reef is breath taking! Quite literally ... with a steep and challenging descent down narrow steps, you eventually find a piece of heaven. The accommodation is simple but very comfortable. With no TV or radio in the room, you’re sent to sleep by the sound of waves crashing on the shore outside. At times it sounds like the waves are going to catch your toes it’s that close!! A beautiful, quiet haven tucked away in the southern top of Bali, this is the perfect retreat after a long flight as it’s close to the airport but away from the crazy traffic and crowds. Highly recommended. Absolutely love the sound of the wave and the breeeze that we can enjoy from our room. Christophe is a really great and helpful host 👍🏻 the walk to the hotel is very ‘adventurous’ but it’s totally worth it! This place is absolutely amazing! The stairs of death (about 150 steps straight down) didn't bother us once we saw the view! And we were in the cliff villa which is right over the water. I take my hat off to the lovely ladies in the kitchen/reception. They work very long hours but were always smiling, friendly and helpful. And their food was some of the best we had in Bali. The manager, Christophe, was also very helpful and friendly and stopped to chat and make sure everything was ok with the room and resort. He also pointed out a dugong that is a frequent visitor. Perfect position for a surfer or couple looking to escape the norm and try something a bit different. A pool would be really nice though. Great hotel on the cliff with amazing views of the beach. It is a quite a steep walk down the stairs to get to the hotel but the staff helped us carry our luggage. You pretty much have the beach all to yourself which is awesome. Friendly and welcoming staff. The view is splendid and I wish we stayed longer. Great stay, friendly staff! Perfect location! Will be back! My fiance and I stayed at Rock n Reef for 7 days and it was one of the best hotel stay and holiday experiences of our lives. Everything from asking Chris to arrange something special for us upon arrival to him and his staff looking after us during our stay was absolutely amazing. I can't see us even considering staying anywhere else Uluwatu when we visit there again. We would hightly recommend Rock n Reef. Not only because of the stunning location but also because of Chris and his staff. Thanks for an amazing expriance.